Thank you for your interest in joining Temple Etz Rimon and becoming a part of our growing North Coastal County Reform Jewish community. We are proud of our congregation and the opportunities we offer members to get involved at a level that suits their personal needs. Our congregation welcomes members of all ages and family backgrounds. 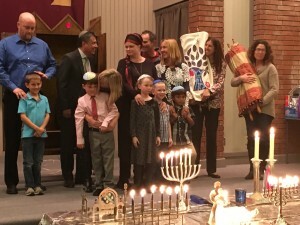 By participating in Shabbat and holiday services, social action programs, the Lifelong Learning Program, Religious School, Youth Group, Sisterhood, or Men’s Club, you will enjoy a rewarding Jewish experience and the comfort that comes with belonging to a warm and welcoming community. While we hope you enjoy browsing our website, visiting our congregation is the best way to get a sense of our community. Join us at Shabbat services or at a holiday celebration to meet us and learn how Temple Etz Rimon can meet your Jewish needs. We look forward to welcoming you to our family! Please download the Membership Form and feel free to contact us with your questions about Temple Etz Rimon. PayPal and dues information is available here.